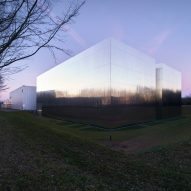 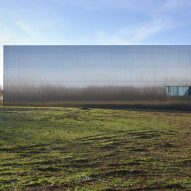 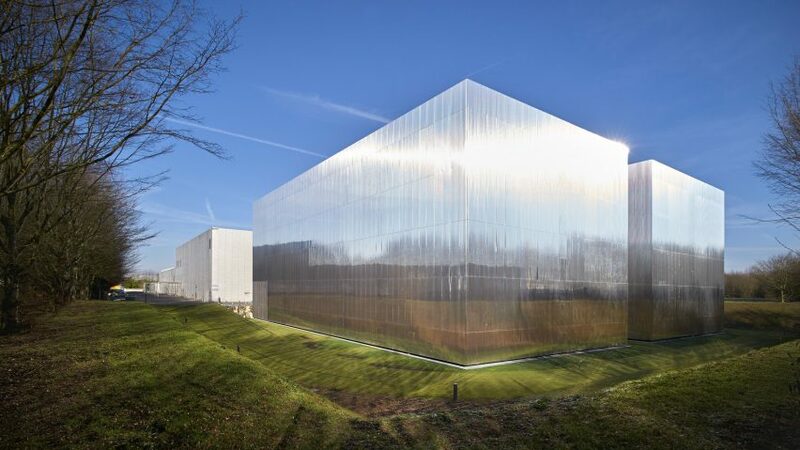 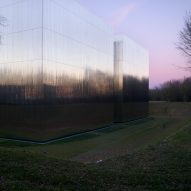 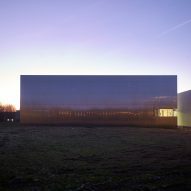 This pair of enormous mirrored-steel boxes connected by a glazed bridge were designed by Antonini + Darmon and RMDM, to complement and extend an aluminium-clad archive facility outside Paris. 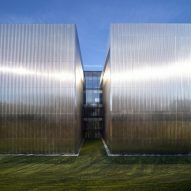 The CTLES (Technical Centre for Books of Higher Education) is a national public administrative institution located in the Parisian suburb of Bussy-Saint-Georges, around 25 kilometres east of the city centre. 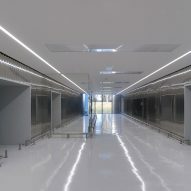 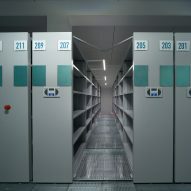 The facility is operated by the Ministry for National Education, Higher Education and Research, and is responsible for the preservation and communication of documents for universities and research centres in Paris. 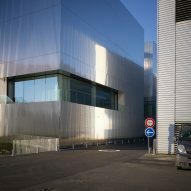 The campus, designed by French architect Dominique Perrault in 1994, is shared with the French National Library and comprises workshops, storage areas, offices, conference rooms and classrooms arranged perpendicular to a covered indoor street. 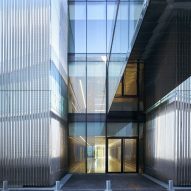 The new addition by Paris-based studios Antonini + Darmon and RMDM slots in to the south of the existing buildings, and is connected to them by a glazed bridge. 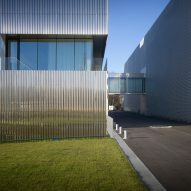 Its geometric forms echo the layout and architectural style of Perrault's building, with an internal road that extends around the periphery of the campus creating a clear separation. 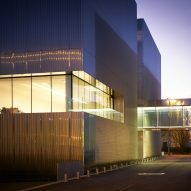 "Maintaining the consistency and integrity of the existing building, our addition represents a natural extension, but detached to avoid distorting the original structure," said the architects. 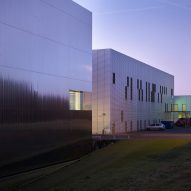 The main difference between the old and new buildings is the cladding material. 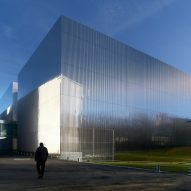 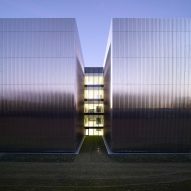 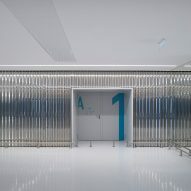 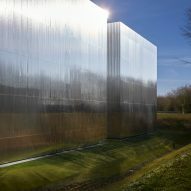 To create a contrast with the aluminium exterior of the original campus, the project team wrapped the extension in ribbed panels of reflective stainless steel. 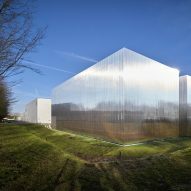 The shiny metal reflects the sky and the greenery of its landscaped setting, as well as the surrounding trees and fields. 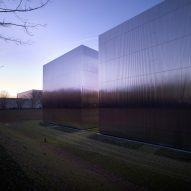 The design and layout of the extension is based on the need to create a protective environment for the archives. 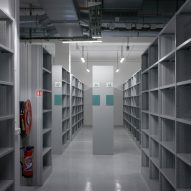 It also facilitates easy movement of the documents and a straightforward, intuitive experience for staff and visitors. 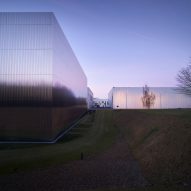 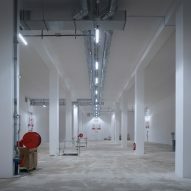 Two silo buildings that house the document collections are accessible from a glazed central gallery that allows natural light to permeate into the public areas. 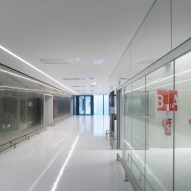 The periphery of the building contains all the technical services. 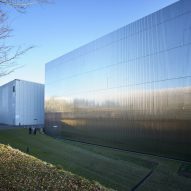 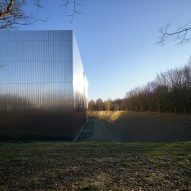 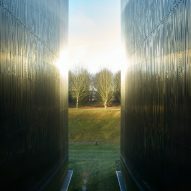 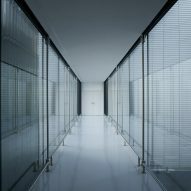 Materials used externally are also applied inside the building, with the reflective metal walls lining circulation areas and the archive spaces. 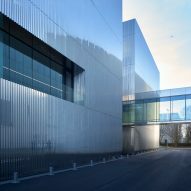 A meeting room on the first floor incorporates a large corner window that overlooks the rest of the campus on one side and the nearby field on the other.